The California Pops Orchestra with the Pops Singers Carly Honfi and Matthew Hall joins forces with the Black Tie Jazz Big Band for its annual Big Band tribute show, “Swingtime at The Pops.” A perennial audience favorite, this concert features toe-tapping tunes from Big Band masters such as Glenn Miller, Tommy Dorsey, and Benny Goodman, as well as pieces from more recent composers and musicians who embrace the Big Band sound. 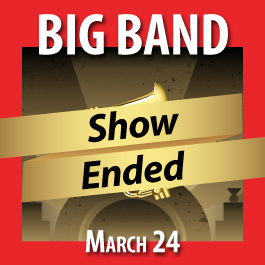 Capitalizing on the unique combination of symphony orchestra plus big band gives the California Pops an unmatched opportunity to bring special arrangements, originally created for live radio broadcast, to be heard and enjoyed for the first time in decades. These arrangements are an essential part of the Pops’ ability to delight audiences and bring those heady, swinging Big Band years to life once more.